First off, why is it chiles and not chilies? According to the The Times Stylebook, chili is a thick soup or stew consisting of beef, (or other meat, but don't ever say that to a Texan) chiles (with an e) and spices whereas chile is both the country (when capitalized) and peppers, more specifically hot peppers. The word "chili" in chili powder is spelled with an "i" because this is a blend of spices intended for use in chili or other Mexican inspired dishes. 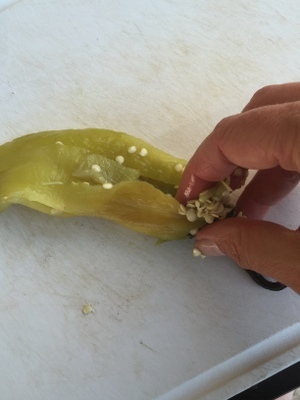 What makes a Hatch chile a "Hatch chile"? 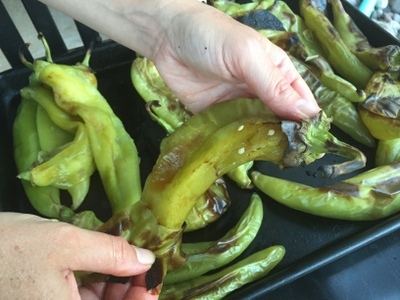 While we have access to many types of chiles year-round, Hatch chiles are unique to the US and grown in one valley in New Mexico. Grocery stores all over the southwest sell "Hatch" chiles during August. I put this in quotes, because some stores even in New Mexico may sell chiles as Hatch chiles even though they are not from the Hatch valley. Just ask the vendor what region of New Mexico they are from. If they can't answer or say something other than Hatch valley, you can move on or simply buy them knowing you may not get the profound flavor that this valley produces. That said, if you happen to be traveling through New Mexico along Interstate 25 or 10 during this month, you aren't too far from Hatch. It's just north of Las Cruces. (I've heard it smells like chiles in the Hatch valley) Do this for me, stop at a roadside stand for a burlap bag-full and order anything on any menu in the state that has a roaster sitting outside. Then email me or comment here and tell me how it was. I still haven't made it to the source to experience a hatch chile burger! Speaking of roadside roasters, here's where I'm going to save you a ton of money. If you live in a place where grocery stores celebrate hatch season by setting a gas-fired roaster outside the stores and lure you to buy the freshly roasted chiles, don't be tempted. I will fill you in on at little secret...you're paying them to do the easiest part of the process. Sometimes this can be as much as four times the price of buying the fresh chiles and roasting them yourself. Roasting them is super easy and takes maybe 15 minutes. Peeling and seeding them takes longer, but you have to do that even if they roast them for you. Besides when you consider the fact that you can garner the equivalent to approximately 20 cans of green chiles (about $1 per 4 oz can with marginal flavor) for about $5 or less, this time is a great savings. As with all seasonal eating, time preserving now pays off later. You can be eating a steaming bowl of green chili (yes, with an "i") in January based on the hour of work you do now. The roasted and peeled chiles freeze very well. You can seed them after thawing if you don't want to take the time now. Oh, one more tip, watch the signs at your store, there are hot chiles and mild or medium. I haven't personally noticed a difference between mild and medium, but get a hot one and you will know it. What else can you do with hatch chiles? Serve them on a burger, chop them up and add to pimento cheese (a delicious Southern spread if you've never had it), hatch chile scrambled eggs with green salsa, make a deluxe but mild version of salsa verde, stuff them with sausage, cream cheese or rice and beans or all of the above. 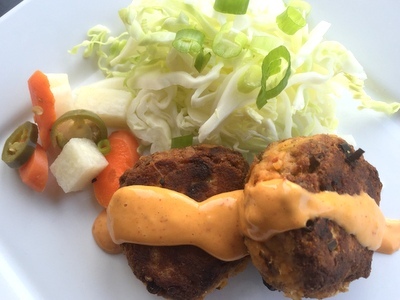 I could go on, but this post is really about those delicious Paleo Hatch Chile Salmon Cakes. So rather than me rambling on, why don't you tell me how you like to use green chiles (hatch or otherwise). Turn them when they are blistered to the other side and broil til that side is blistered. Peel the chiles after they have cooled to the touch buy simply pulling at a blistered part then removing all the skin. Remove the stem and top seed pod. 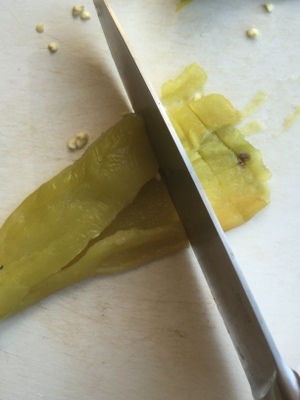 If you are wanting to store the chiles already processed for recipes, you can chop them into a 1/4" dice like you would find in canned chopped chiles. Otherwise leave them whole so you can use them for stuffed chiles (try to make sure you don't rip them completely open like I always do by mistake if you want to stuff them, but if you do, just roll the stuffing inside like a burrito). Drain salmon and empty into bowl then add remaining ingredients. Form into cakes. I used a large ice cream scoop to portion and got about 11 cakes. You will probably have 10-12 depending on size. Serve with a side salad and chipotle mayo. (I will post my homemade chipotle lime mayo soon, but for now, just puree one chipotle chile with adobo sauce with 3/4 cup mayo and a squeeze of lime juice) I also had some hot pickled veggies so I plated those with as well. Mix all ingredients together and form into 3" cakes. If mixture isn't sticking together well, add a little more almond flour a tablespoon at a time. Heat oil in skillet over medium high heat. While oil is heating mix together chipotle mayo ingredients. Carefully place one layer of salmon cakes in the skillet and fry until golden on both sides. Serve over cabbage with chipotle mayo. 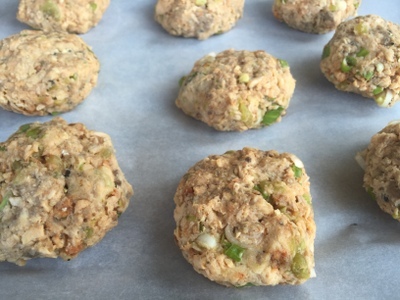 I used the large cans of salmon that include skin and bones and just removed the skin and bones before making salmon cake mixture. This yielded probably the equivalent to 3 1/2 small (6 oz) cans of boneless, skinless salmon. If you use 4 6 oz cans the mixture may be dry. If so add a little more almond flour to hold it all togther.